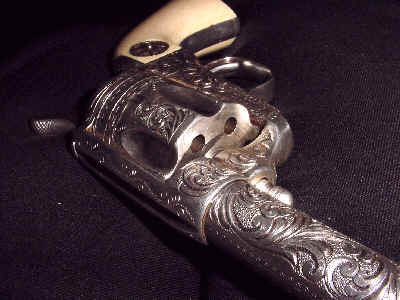 This is an awesome revolver with everything that Collectors seek - Spectacular Looks - Rarity - Collectivity - Function. 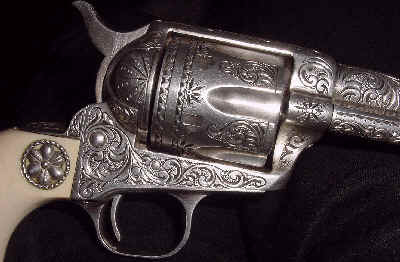 Seldom does one get a chance to own such a fine revolver. 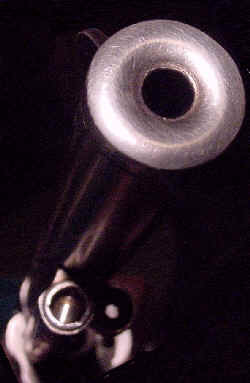 This is a black-powder Frame Single Action Army Cavalry in .22 rimfire caliber. 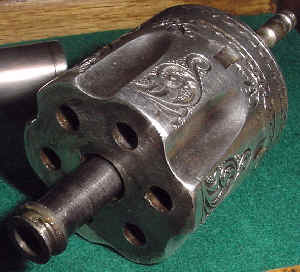 With a full 7-1/2" barrel, this is one of the heaviest pieces of "Iron" that was ever packed. 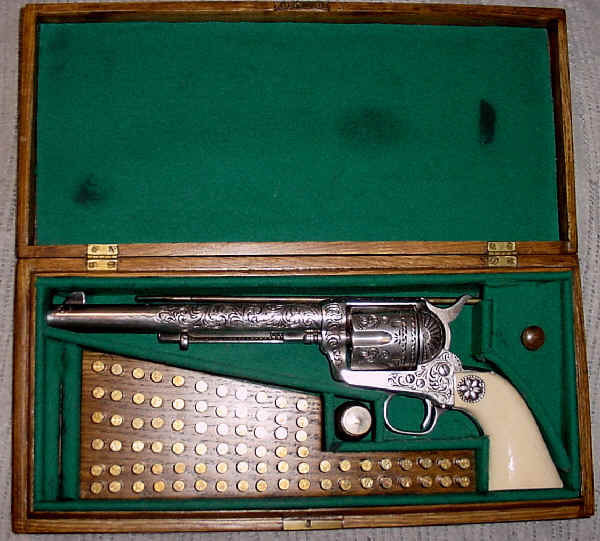 It comes in an English Style Case with accessory compartment, an 80 cartridge block and Oil Bottle. 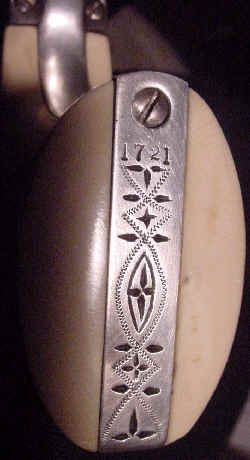 Original Key and functional Lock. 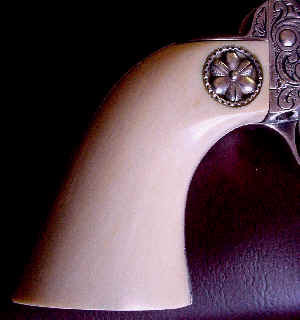 The Helfrich style engraving is truly 100% coverage that is stylistic of the old West. 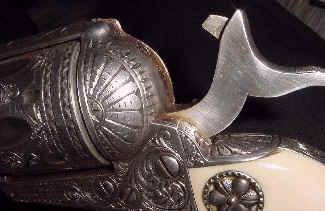 Deep-Cut with lots of Scrolls and "Rays" that make it look like it would be a Fast-Draw champion. 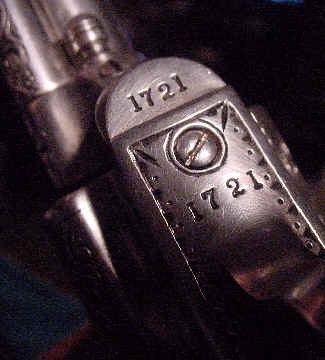 The 2-line patent date and the single line barrel address are stylistically bordered and displayed. 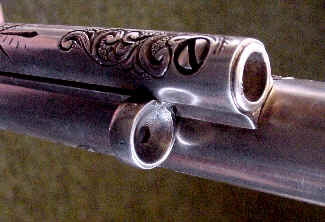 The engraving shows Helfrich style all-be-it lacking the precise Helfrich detail. 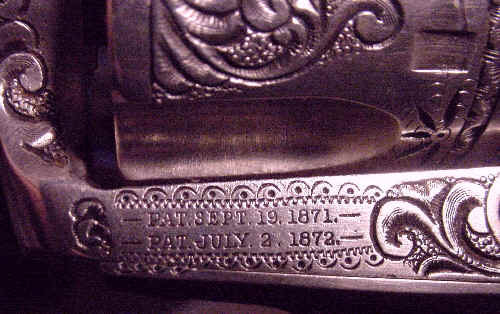 Actual engraver is not known. 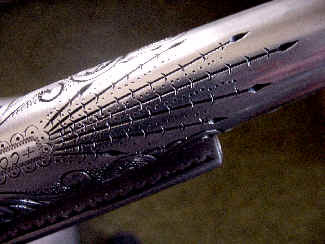 Although the engraving looks sparkling fresh in these photos, much fine patina shows it is not young. 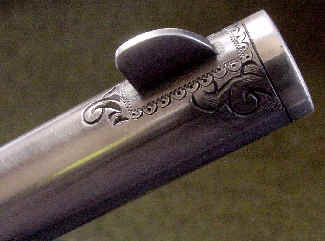 Its amazing how many places show the stylistic artistry of the Engraver. 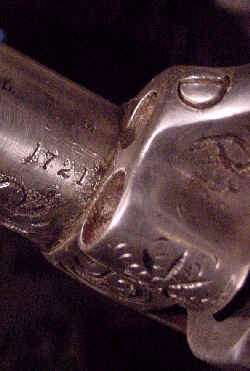 Serial numbers are matching throughout. 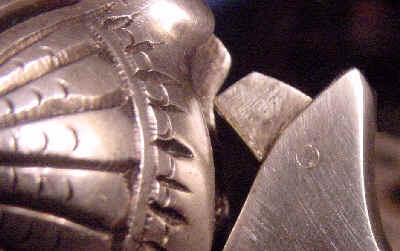 Even the Ejector housing is numbered. 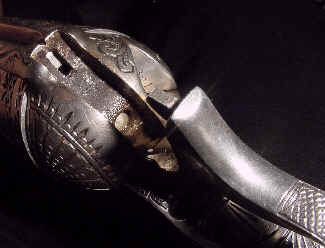 Ejector Housing is an early type-2. 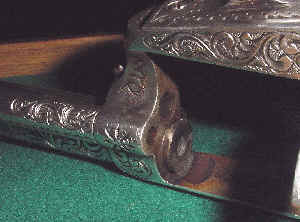 It is not slotted with a closed end. 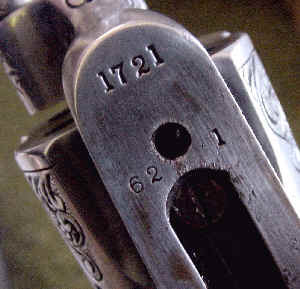 Assembly number 621 is stamped on the bottom of the frame and matches the loading gate number 621. 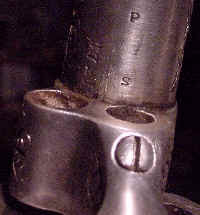 Barrel has "P" and "S" inspection marks. Backstrap has "S" and "Star". 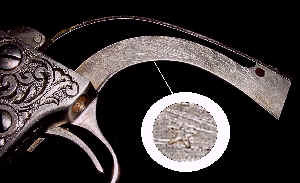 Triggerguard has "Star" only. 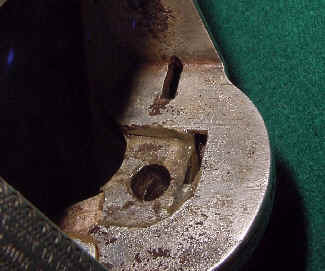 Frame has a rectangular slot for the rimfire firing pin. 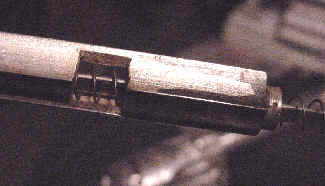 Hammer has rimfire rectangular firing pin. 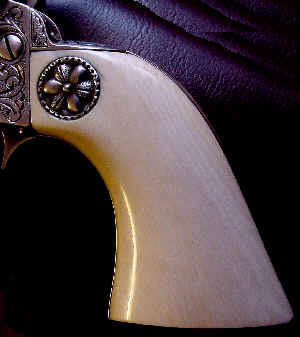 The one-piece Ivory grips are 3-piece construction with an Ivory inner spacer. 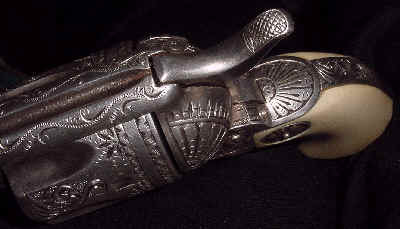 Each side has a Silver Conch. 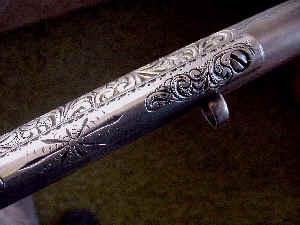 Inside top of frame has black-powder cut-out. 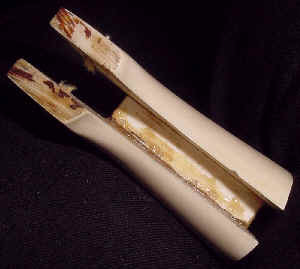 Cylinder has a removable Cylinder Pin bushing. 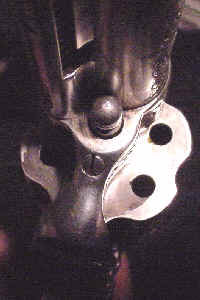 A fun Single Action Army in .22 rimfire caliber. 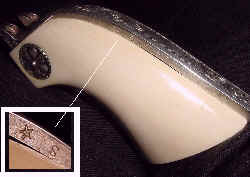 This is a most detailed description of this very rare Colt SAA in .22 rimfire caliber. 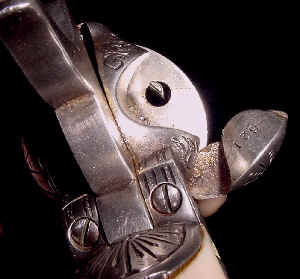 However, we cannot guarantee that this work was done at the Colt factory. 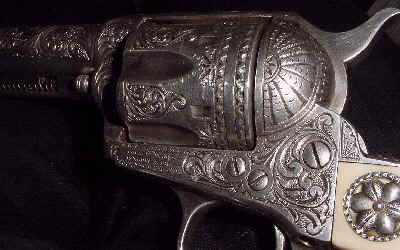 It may have been a private alteration from center-fire that was later Engraved and Silver finished. 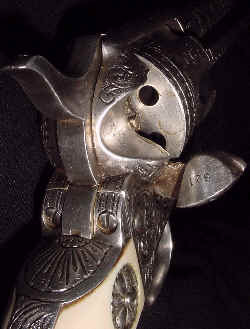 Its long ago history is unknown. Given these facts, it has been priced accordingly.